The radical changes came with the iPhone X last year. So, while the elegant new iPhone XS Max that I've been testing since Wednesday (along with the XS) has, by far, the largest display and is the most expensive and best iPhone ever, Apple's latest handsets, good as they are, don't move the needle all that much. The robust A12 Bionic processor inside means the handsets are faster, snappier, primed for immersive augmented reality, and, in theory, more power-efficient—that's hard to judge in a few days—with Apple claiming marginally better battery life. But it's not like prior models, which on Monday got a performance boost with iOS 12, which were poky. A year ago, of course, Apple launched the X as the first model to exorcise the home button, go all-in on Face ID facial recognition (at the expense of the Touch ID fingerprint system) and, oh yeah, crack $1,000. Those of us who bought the X—and it became Apple's most popular phone after its release—had to learn a few new gestures, which, thankfully, were fairly intuitive. By now, most X buyers have made peace with all that and may have even gotten used to the notch at the top of the display that consists of the front camera and sensors that make Face ID even possible—and that remains on the newest models. And Face ID, in my experience, typically works really well. The only recourse for those of you who want a new iPhone but haven't come to grips with the disappearance of Touch ID and the home button is to purchase either an iPhone 7- or 8-series device that are still in Apple's lineup. With that perspective, here's what I like about the new iPhones, and here are my gripes. If you've read the specifications, you already know the iPhone XS Max has a beautiful edge-to-edge 6.5-inch OLED display, the largest ever on an iPhone—it makes the iPhone XS, despite its own large 5.8-inch screen, look relatively puny. Even so, thanks to reduced bezels, the XS Max has a smaller footprint than the iPhone 8 Plus, whose screen size is 5.5 inches. It is also slightly smaller than Samsung's rival Galaxy Note9, which has a 6.4-inch screen. The upcoming XR will have a 6.1-inch screen. The new gold finish of my test unit—the other available colors are space gray and silver—is really attractive, but like many people I cover up the finish with a case anyway. Apple says the XS and XS Max displays are fortified with what Apple claims is the most durable glass yet on a smartphone. Short of trying to smash or scratch the device, I'll have to take their word for it. But the cameras can compensate for a photographer's shortcomings, like if you were shooting with the sun washing out the background of your subject. Which is not to suggest that you still can't take a bad picture. What I can say, though, is that I was extremely pleased with the quality of the pictures I took under all sorts of lighting conditions, including in dim settings. Apple has improved the portrait mode feature by letting you adjust the depth of field and "artful" background blur, after you shoot, even on the front camera. While Apple is not the first company that lets you change the blur effect after the fact—some Galaxy's have had the feature for a while—its presence on the new iPhones is welcome just the same. You can now capture stereo audio when shooting a video, thanks in part to four built-in microphones. I tested stereo recording during a Paul Simon concert I attended over the weekend inside Newark's Prudential Center. The resulting audio sounded really good, just like you expect to hear on a live album. I can practically hear you budding garage musicians cheer. Granted, this isn't an XS- or XS Max-only feature since the upgrade also freshens up older iPhones, including models dating as far back as the iPhone 5S. But iOS 12 offers a number of useful features, from Screen Time reports and time limits that promise to help tame digital addiction to video effects in FaceTime and iMessages. This is a feature that you're not going to be able to take advantage of immediately. But dual SIM technology will let you have two separate numbers on your single device—one perhaps for your job, another that's personal. You will need carrier support, though, which comes later. This isn't a novel feature; overseas phones have had dual SIM support for a while. Frequent travelers likely will appreciate it. Think about this for a second. If you buy the iPhone XS or XS Max with the maximum storage capacity of 512GB, you're looking at $1,349 or $1,449, respectively, or well within the price range of a new, medium-spec'd MacBook Pro laptop. I recognize that for many of us, the smartphones in our pockets have become our computers and that not everyone is going to max out on storage. But jeez, even the "cheaper" phones aren't exactly cheap, with the 64GB XS and XS Max versions fetching $999 and $1,099, respectively, and the 256GB version $1,149 and $1,249. I also realize that four-digit price tags have become the cost of admission for top-of-the-line premium phones nowadays and that trade-ins and monthly installment plans can ease the pain somewhat. But it doesn't mean I have to like it. Though I haven't tested it yet, it is for this reason that some of you may want to hold out for the iPhone XR next month. 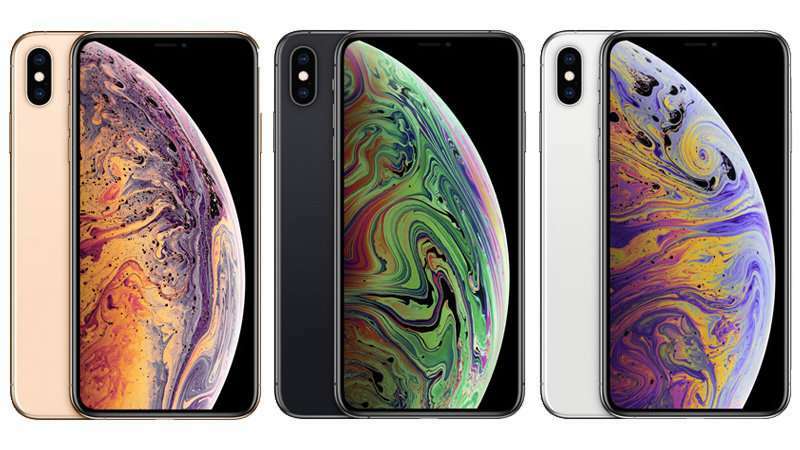 It starts at $749 and has most of the features of the XS and XS Max, save a second rear camera and a screen that, while very good, isn't as fancy as these higher priced iPhones. It's bad enough that the iPhones of the last few years did away with the standard-sized headphone jack. I had no illusions that Apple was going to bring back the jack with the XS or XS Max. But Apple no longer includes a $9 adapter in the box that you can use with your existing wired headphones. It smacks of stinginess. I get that Apple is pushing wireless Bluetooth headphones, especially on its own AirPods and Beats products. But still. No, you're not going to not buy an iPhone because of its name. But even though I know the iPhone X is pronounced iPhone "Ten," I've been stumbling with the XS, calling it just that, "ex-ess," rather than its official name, "ten-ess." I happen to be a fan of large displays, so this is more a complaint for those of you who aren't. That's why it's a shame that Apple discontinued the iPhone SE (or didn't introduce a new one) with a 4-inch display. I'm not buying the silly narrative making the rounds that Apple is being sexist toward women here because I know females who like larger phones—and men who like smaller models. I just wish a small screen was still an option because choice is good. The new iPhones supports faster charging, and that's great—about a 50 percent charge in a half-hour, Apple says. Unfortunately, you'll only see such results with an optional USB-C accessory and not the slower charger included in the box. As I said, Apple's radical changes came last year, so it was expected that the changes in the new iPhones are mostly of the incremental variety. That doesn't mean, though, that we couldn't wish for something more, like, say, a fingerprint sensor—or Touch ID—built into the display. Put that on the wait-until-next-year wish list.